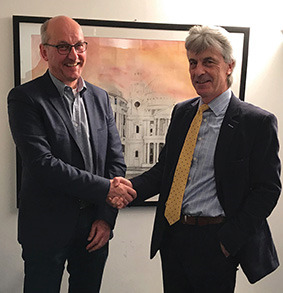 Primalec, a leading UK producer of leak control and air conditioning service solutions, has entered into a strategic partnership with Dutch firm Unicorn Tools. Ronald Viskil (left) and Richard Doran. The partnership constitutes a logical extension of a long-standing relationship between the two owner-managed businesses, with Primalec’s Richard Doran and Unicorn’s Ronald Viskil having known each other and traded regularly for over 20 years. The alliance will see Primalec open the UK market to a wider range of Unicorn’s product portfolio with faster lead times and less currency risk. These lines will complement Primalec’s Glo-Leak UV, Seal Pro, Leaktronic, NitroTrace, Snow Leopard lubricants and Airco Service ranges in both the mobile and static AC and refrigeration sectors. At the same time, Unicorn Tools will increase the availability of Primalec brands to its own customer base. The deal puts both companies in a stronger position to take advantage of the opportunities presented by Brexit, while minimising its potential threats. Customers are expected to benefit from a safer, more seamless post-Brexit supply chain than might otherwise be the case should disruption occur at the borders. To support the move, Primalec has appointed Aaron Macfarlane to the newly-created role of senior product manager, acr. Bringing 20 years of automotive air conditioning experience, Mr Macfarlane will manage major elements of both the Primalec and Unicorn Tools acr product portfolios. Primalec will be exhibiting its products at Automechanika in Birmingham’s NEC on 04-06 June, on stand T150.